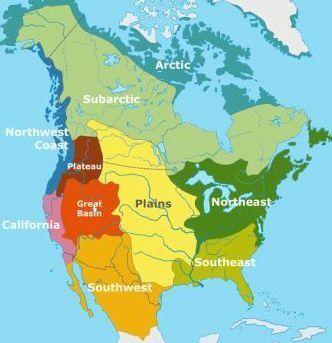 The climate, environment, land and natural resources that were available to the Indian tribes in this area, located in the very center of North America, resulted in the adoption of the culture shared by the Great Plains Indians. Learn about the life of the Great Plains Indians. Discover facts and information about the natural resources available, the languages, culture, clothing, their religion, beliefs and ceremonies. Pictures and images illustrating the Great Plains Indians. The way of life of the Great Plains Indians was dictated by climate, land, natural raw materials available and the animals, fish, birds, plants, nuts, berries and trees. 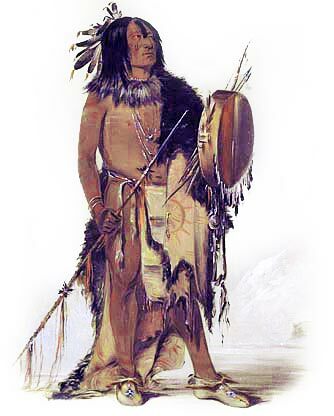 Their subsistence was related to agriculture and hunting. The natural resources and materials available provided the food and the clothing of the Great Plains Indians. The weather and the changing seasons also affected their way of life at different times of the year. Their language, weapons, trading currencies, beliefs, ceremonies and religions were also important elements of their way of life. The Great Plains Indians who lived on the borders of lands often reflected two types of lifestyles. The European settlers introduced the horse to North America and the Great Plains Indians became expert horsemen and hunters. The horse enabled them to adopt a nomadic lifestyle following the great herds of animals. The climate, land and natural resources that were available to the Indian tribes resulted in the adoption of the Great Plains Indians culture. Types of housing, homes or shelters: Tepees were used by the nomadic hunters. The semi-nomadic Mandan used tepees but also maintained permanent earth lodge villages situated along rivers. The languages of the Great Plains Indians included Siouan, Algonquian, Uto-Aztecan, Caddoan and Athabaskan. The introduction of the horse in the 1750's enabled many Indian tribes from other regions to travel to the Great Plains to hunt buffalo. The Great Plains hunting culture was relatively short lived as it was replaced in the 1880's by the European settlers who became the farmers, cowboys and cattlemen. In the 1870's the deliberate great slaughter of the northern bison herds began designed to prevent the Native Indians continuing the Great Plains lifestyle. Discover facts about each of these Great Plains Indian Tribes. Indian Territory was a vast area of U.S. federal territory on the Great Plains reserved for Indians from the 1830s to the 1880s. Indian Territory eventually became the states of Kansas, Nebraska, and Oklahoma. By 1907, when Oklahoma was admitted as a state, Indian Territory ceased to exist. The physical characteristics of Great Plains Indians are dark brown eyes, prominent cheek bones, straight black hair, and scantiness of beard. The skin color of Native Indians varies from very light in some tribes such as the Cheyenne, to almost black in others, such as the Caddo and a yellowish color in such as the Flatheads. The Great Plains area includes the States of Iowa, Kansas, Minnesota, Missouri, Nebraska, North Dakota and South Dakota. The Geography and Environment can be generally described as hot summers and cold winters. Grass covered prairies. Some streams and rivers. The animals were very important to the Great Plains Indians. Animals included Bison (Buffalo), deer, cougars, elk, bear, beaver, porcupine, antelope, prairie dogs, eagles and wolves. The uses of the animals were varied and included food, clothing, shelter and decorations. The different types of Houses, Shelters and Homes depended on the materials available and whether the home was permanent or temporary. The homes of the Great Plains Indians included tepees which were suitable for their nomadic lifestyles. The Religion, Ceremonies and Beliefs were based on Animism. Animism was a commonly shared doctrine, or belief, of the indigenous people of North America and Canada including the Great Plains Indian tribes. Animism is based on the spiritual or religious idea that the universe and all natural objects have souls or spirits. In this religion it is believed that souls or spirits exist not only in humans but also in animals, plants, trees, rocks etc. This belief is also extended to natural phenomena such as thunder storms and rain and geographic features such as mountains, caves or rivers also possess souls or spirits. The Plains people believed in Manitou, the Great Spirit. The men also carried a pouch called the 'Medicine Bag or Bundle' which included herbs used in Smudging Rituals. The Great Spirit, the Sun Dance and Vision Quest. Tricksters feature in the legends and mythology of the Plains peoples as do heroic figures or "transformers" who transform, or change, the world into its present state. Plains Indians believed in a great god, the Sioux called that god the ‘Wakan Tanka,’ which means the Great Spirit. The Sun Dance was a ceremonial dance performed by North American Plains Indians in honor of the sun at the summer solstice. This mystic ceremony was to prove bravery by overcoming pain. It was typically marked by several days of sleepless fasting and group dancing. Ritualized self-torture was undertaken as a penance or to induce a Trance State or vision. The Blackfoot Confederacy consisted of the Piegan people, the Blood people called the Kainai, the Blackfoot People also called the Siksika which means 'Blackfoot' and the Sarcee tribe. The other tribes of the Great Plains Indians known to inhabit the area were the Arikara, Assiniboin, Cherokee, Chippewa, Dakota (Sioux), Delaware, Fox, Gros Ventre, Hidatsa, Illinois, Iowa, Iroquois, Kansa, Kickapoo, Kiowa, Kiowa Apache, Miami, Mandan, Missouri, Munsee, Ojibwa, Omaha, Osage, Otoe, Ottawa, Peoria, Ponca, Potawatomi, Quapaw, Sauk, Seneca, Shawnee and Wyandot (Huron) tribes. The Great Plains Indians! Discover the vast selection of pictures and videos of Great Plains Indians. The pictures show the clothing, weapons and decorations of various Great Plains Indians that can be used as a really useful educational resource for kids and children of all ages. Our series of videos enable fast access to the images, pics, paintings and pictures together with information and many facts. We hope that this article on Great Plains Indians will assist in your studies or homework and that you will enjoy watching the videos featuring many pictures of the Great Plains Indians. A great educational resource for kids on the subject of Great Plains Indians.